Summarizing the prior year in wrestling, 2017 Topps WWE Road to WrestleMania highlights key matches as well as WrestleMania 32. Collectors can find two hits in each hobby box. Covering the top moments of the last year, the base set consists of 200 cards with Bronze (1:2 packs), Blue (#/99), Silver (#/25-Hobby), Gold (#/10), and Red (1/1) parallels. 2017 Topps WWE Road to WrestleMania base Autographs follow a similar pattern with main versions for key Superstars, Legends, Rookies and NXT Prospects. These are joined by Blue (#/50), Silver (#/25-Hobby), Gold (#/10), and Red (1/1) parallels. Dual Autographs (#/10) put two star signatures on the same card. Other hits in the release contain relics from a variety of sources. Shirt Relics feature wrestler-worn clothing with Blue (#/50), Silver (#/25), Gold (#/10), Red (1/1) and Autograph parallels. 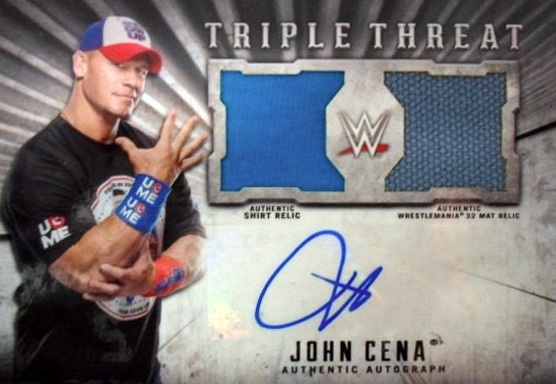 Triple Threat Autographed Dual Relics (#/10) combine a signature with a shirt relic and mat relic. 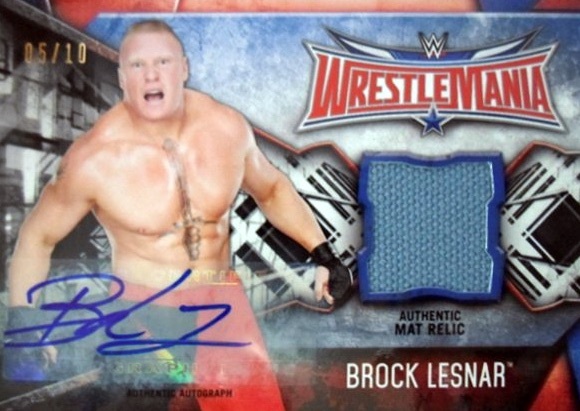 Giving collectors more relics to chase, mat canvas pieces are the focus of several hits in 2017 Topps WWE Road to WrestleMania. This includes WrestleMania 32 Mat Relics and NXT Takeover: Dallas Mat Relics. Both come in Autograph editions as well. 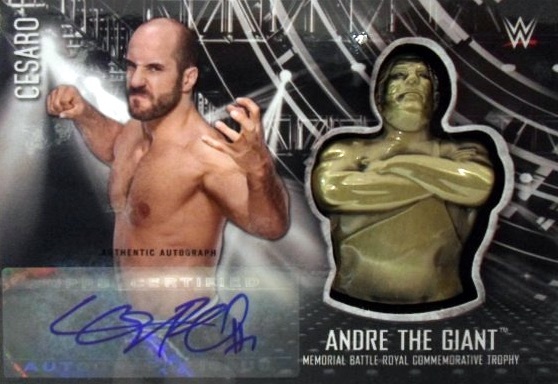 Andre the Giant Battle Royal Commemorative Trophy cards honor the legend with base relics and parallels. Lastly among the premium choices are the familiar Kiss and Autographs Kiss cards that also have Gold (#/10), and Red (1/1) parallels for each version. 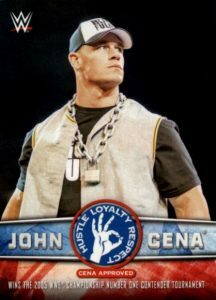 Standard inserts in 2017 Topps WWE Road to WrestleMania include WrestleMania Roster cards and part one of the John Cena Tribute set. 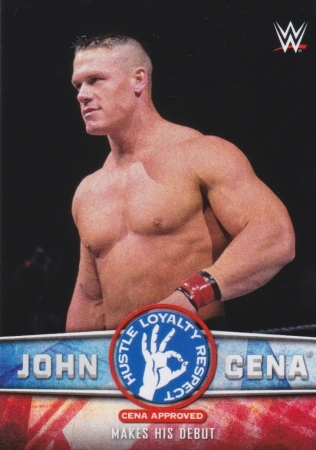 The first ten cards for Cena are found in the RTWM set and the remaining 30 will be issued in later 2017 products. 20 cards. Only found in Walmart hanger boxes. PARALLEL CARDS: Blue #/50, Silver #/25 (Hobby), Gold #/10, Red 1/1, Printing Plates 1/1. 10 cards (of 40). Continuation set. Good: On-card autographs, great event details on the card backs, more than one subject for Tribute sets, more autographed relic options than previous releases. Bad: Few insert options, not enough variety in base checklist, not all cards are hard-signed. The Bottom Line: With a manageable base checklist, less inserts and two guaranteed hits per hobby box, 2017 Topps WWE Road to WrestleMania has a format that can appeal to both set collectors and hit seekers. 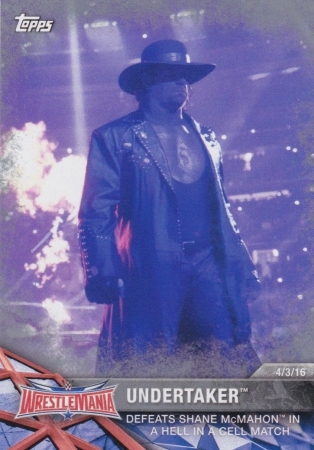 Changing from 2016's framed look, 2017 Topps WWE Road to WrestleMania basically uses a full-bleed design with the edges resembling the crackle from fireworks at the end of each WrestleMania event. However, the subject remains front and center. Surprisingly, the geometric brand logo works well with the card’s overall design. My only complaint is that the white lettering can be hard to read as it blends with the logo coloring. As noted, the hard-signed content is a very nice aspect. 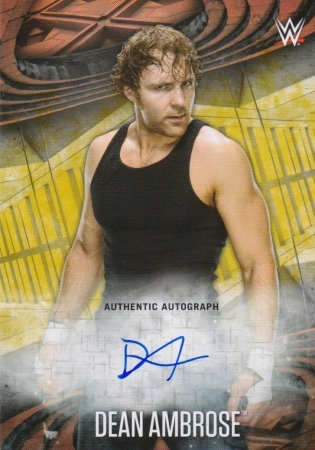 All of the base autographs feature on-card signatures on a slightly altered background from the WrestleMania Roster insert. The designated signature area just above the wrestler’s name fades as it gets closer to the edge, giving space for the autographs. However, this was not enough room for some of the Superstars, particularly females, who signed beyond the area and across the card. Unfortunately, the dual autographs and autographed relics use a sticker autograph which is disappointing especially with many of the combos having a significant connection to one another. As for the parallel colors, the bronze does not really enhance the card, instead darkening the entire image and not just the outlying effect. The other parallel I pulled is silver, which I thought would brighten the card. Unfortunately, all of the Undertaker’s images present him as he is entering the ring when it’s dark and smokey, therefore, the silver somehow made the scenery less vivid. However, the blue, gold and red parallels appear to nicely accentuate the RAW and SmackDown logos. On the positive side, card backs give a brief yet detailed synopsis of the wrestler and match captured on the front, and each card helps shape the rest of the checklist. 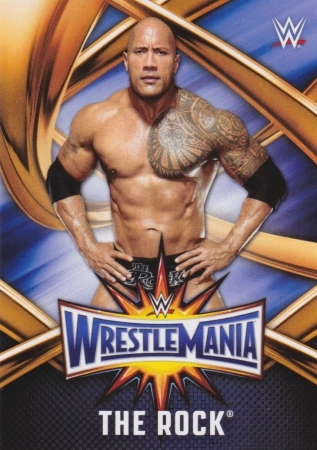 Another issue I had was that each Superstar has a posed image, rather than an action shot, with ribbon-like gold as the backdrop for the WrestleMania 33 Roster insert set. While I like the idea of special images for those who made it to the biggest event, most of the wrestler’s personalities do not come through, making this insert a little too bland for me. Understandably, WWE products will always have a set amount of subjects to work with, however, with WrestleMania being THE biggest spectacle for the WWE Universe, I hoped more Legends would have been included. This is especially true for Hall of Famers given the induction ceremony takes place the night before the big event. That said, you can’t beat the opportunity to own on-card autographs by Brock Lesnar, John Cena, Roman Reigns, Sting and others. Whether you collect for monetary gains or just for fun, 2017 Topps WWE Road to WrestleMania can be an appealing option. The lower price for a hobby box ($60-$70 at the time of the review) that appears more than likely to have at least one autograph, and a concise signer lineup, makes this a harder one to pass up for WWE collectors. I personally enjoy stats/facts and I couldn’t ask for more from 2017 Topps WWE Road to WrestleMania in that regard. As the base, inserts, and tribute sets all supply event and/or career details, I found myself reading about the same Superstar on various cards with each back having different notes about the subject. I have to admit the fact that I pulled a gold parallel autograph of The Lunatic Fringe (Dean Ambrose) made this especially fun for me. Its a piss poor product with a serious lack of inserts.. Those wrestlemania roster cards we can do without as well as those crappy tribute cards.. Look at the inserts topps puts on their wwe app, why can’t we see those as physical cards? Also, Topps is back ripping us off with more commemorative cards.. If they wanna put these as normal inserts, OK.. But as hits? No.. I wish they’d stop making those commemorative cards.. Worst rtwm set so far..
(10) 2017 Topps WWE Road to Wrestlemania EXCLUSIVE HUGE HANGER Box-420 Cards! (40) 2017 Topps WWE Road to Wrestlemania EXCLUSIVE HUGE HANGER Box-1,680 Cards!